This second and final part of the article will investigate a third vision, which is less commonly discussed than the renewable energy and nuclear visions outlined in Part 1. This vision is also less popular, but could be the best pathway towards a sustainable global economy. I therefore urge readers to keep an open mind. The hydrocarbon bridge vision is all about allowing the 6 billion (and counting) developing world citizens to industrialize via the tried and tested pathway. Fossil fuels are simply ideal for the purpose of industrialization. In the electricity sector, they offer low up-front costs, simplicity and flexibility relative to renewables and nuclear. In the transport sector, they offer low up-front costs, universal applicability and practicality relative to electric vehicles. And perhaps most importantly, they are often the only options in the industrial sector which forms the backbone of industrialization. These effects are generally referred to as the social benefits of carbon. When an economy starts to modernize, many of these benefits fall away. For example, slow or stagnant material growth removes the attractiveness of low up-front costs, and a more sophisticated economy allows for the building more complex nuclear reactors and the integration of intermittent renewables and electric cars. More importantly, the effect of further increases in material wealth on the health and happiness of the population flattens out, while the costs (e.g. pollution) created by this fossil-fuelled growth in material wealth keeps increasing. Somewhere along the line, the marginal social costs of carbon associated with further fossil-fuelled material expansion start to outweigh the benefits (illustrated below). This is the point where an economy should migrate from heavy industry to services and start to clamp down on pollution. Unfortunately, the vast majority of world citizens remain far from this transition point, and restricting their excess to the social benefits of carbon is unethical for several reasons. Firstly, and most importantly, the costs of poverty in terms of unnecessary suffering and lost human potential is just immense. People who lived their lives in a developed country already built via fossil fuels will find it hard to appreciate the magnitude of this cost, but take it from a guy who grew up in Africa: this cost is tremendous. Some quantification will follow later in this article. Secondly, industrialization is the single best way for developing world citizens to protect themselves against climate change. Reasonable medical facilities to treat new infectious diseases, proper housing to resist more turbulent weather patterns, and well developed trade channels to smooth out the effects of local crop failures are just some examples of the benefits of industrialization in a changing climate. Thirdly, industrialization is a very effective way to reduce population growth – the fundamental multiplier of all our sustainability challenges. In the following section, I will demonstrate the magnitude of only the up-front cost benefit of fossil fuels. Other benefits such as simplicity and broad applicability are ignored, but, as we will see, the results are clear. India is poised to become the next highly polluted economic development miracle, following in China’s footsteps. By several measures such as GDP, median age and energy consumption, India is almost exactly one generation behind China in terms of economic development. It therefore provides a good example for illustrating the social benefits of carbon. Let us focus only on the electricity sector and calculate the opportunity costs related to building nuclear or solar power plants instead of coal plants (assuming that this is technically feasible). India’s electricity production and GDP have been increasing in lock step for the past 3 decades. Maintaining a 7% growth rate in 2016 implies GDP growth of $145 billion and electricity production growth of 91 TWh. The capacity and cost of achieving this with coal ($1000/kW at 80% capacity factor), nuclear ($2000/kW at 80% capacity factor) and solar ($1000/kW and 20% capacity factor) are shown below. 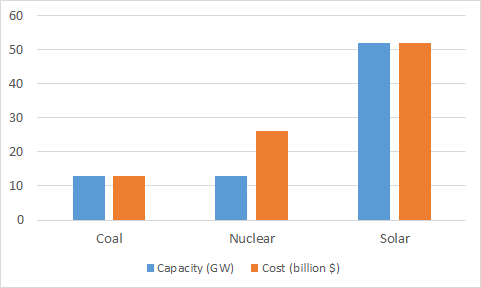 It is clear from the graph that the nuclear and, especially, the solar capacity would be much more expensive than the coal capacity. Investing in this more expensive capacity will divert resources away from other growth-enabling projects like decent housing, roads, commercial outlets, factories, hospitals and schools, thus slowing down economic development. 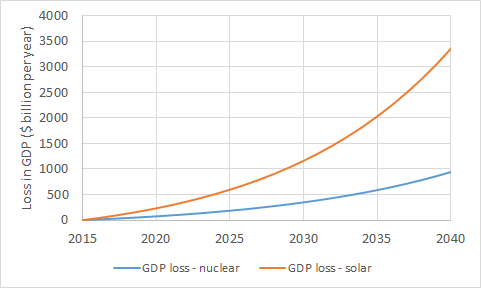 A fuel saving of $1.6 billion will be achieved by the solar option, but this is very small relative to the $37.2 billion in additional capital costs (assuming solar capacity can directly displace coal capacity). Fuel savings will increase rapidly with time as the total clean energy capacity grows, but the excess capital expenditures will also increase with time as more new capacity is needed every year. The difference between losses from more expensive capital and gains from fuel savings will subtract from real GDP growth. As shown below, this cost compounds strongly over time. In 25 years, when the Indian economy approaches the size of the Chinese economy today, this opportunity cost has increased to a massive $3.4 trillion per year. Nuclear fares much better, but the yearly losses are still large. One could also point to the external costs of coal which will be avoided by building nuclear or solar plants. However, I think there can be little doubt that the externalities of not building housing, roads, hospitals and schools (e.g. deaths from malnutrition, infectious disease and exposure) will far outweigh the externalities of cheap new coal plants (e.g. deaths from air pollution, coal mining and climate change). As a crude quantification of the social cost of poverty vs. the social cost of air pollution, we can note that the current life expectancy at birth in India is 66.2 years, while this number is 75.2 in China. To make this difference more real, imagine 8 newborn Chinese who are each destined to live 75.2 years. In India, on the other hand, for every 7 people who will live to the age of 75.2, one person dies at birth. 25 million Indians are born every year. This implies that, relative to China, more than 3 million people die every year as a result of poverty. In contrast, a recent study has found that coal power plants kill 87000 Chinese per year. Yes, these deaths are tragic, but the number is small compared to 3 million, especially considering that India burns 5 times less coal than China. Social costs of carbon are very real, with climate change arguably being the most important. 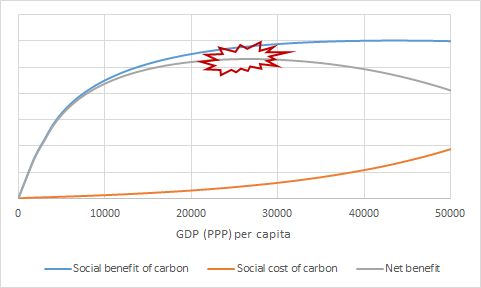 The social costs function in the first graph in this article is therefore very important, and it will play a big role in determining when the use of fossil fuels should be curtailed. Another important point to consider is that the maximum net-benefit point will be reached most rapidly by full speed Chinese-style industrialization. The earlier this point is reached, the earlier a nation can start contributing substantially to the global clean energy transition. 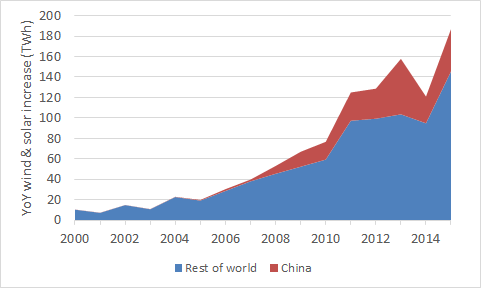 As an example, China’s contribution to wind and solar power growth is illustrated below. This magnitude of clean energy contribution would not have been possible without decades of shameless capitalization on the large social benefits of carbon. China also manufactures most of the world’s solar panels and a quarter of the world’s wind turbines. In addition, China accounts for a third of the nuclear capacity currently under construction around the world. Truly, if not for the coal-driven Chinese economic miracle, clean energy would be many years behind the point it is today. Finally, it should also be considered that rapid emissions cuts will become increasingly feasible as nations become wealthier. When the time comes, mechanisms like CCS retrofits, early retirement of polluting infrastructure, large-scale reforestation, bio CCS and direct air capture of CO2 will all require populations with a fat slice of discretionary spending power. Successful construction of a global hydrocarbon bridge to sustainability is critical to give billions of people a decent standard of living, to shield these people against the worst effects of climate change, to accelerate the development of clean energy, and to enable rapid emissions cuts in the future. How can this be done? The theory is very simple: do nothing until the marginal costs of carbon exceed the marginal benefits and act strongly thereafter. As always, the problem lies in the quantification of social costs and benefits. A broad range of opinions on these points exists as summarized in the figure below. Which box best describes your view? Clearly, I’m in the top-right box. 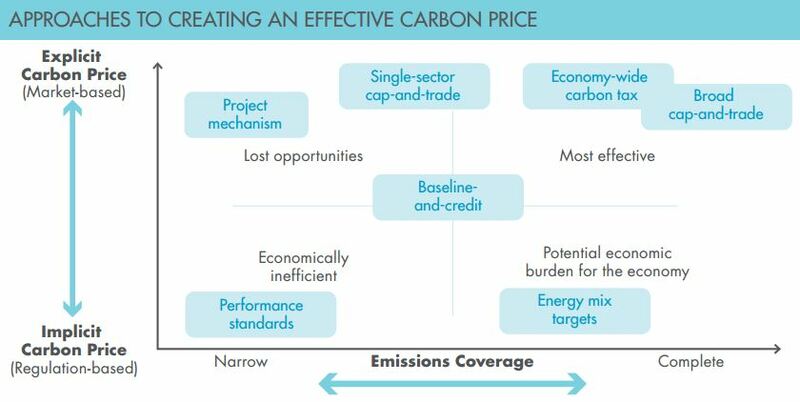 This box will push for efficient mechanisms like a carbon tax or cap (see below) in all nations that have already tapped the most important benefits of fossil fuels. The range of $20000-30000/capita GDP (PPP) appears to be a good window for implementing such mechanisms. Poor nations with a GDP (PPP) per capita below $20000, on the other hand, should be aided in rapid fossil-fuelled industrialization via technology transfers and the removal of political pressures to play a near-term role in greenhouse gas reductions. Some unsubsidized clean energy deployment will become possible in these nations with time, but any clean energy subsidies/mandates should be sponsored by rich nations. Those who are truly concerned about climate change (myself included) should know that an increase in carbon emissions over the next two decades or so will enable a much steeper reduction in emissions thereafter, and also allow society to cope with stronger climate change effects. 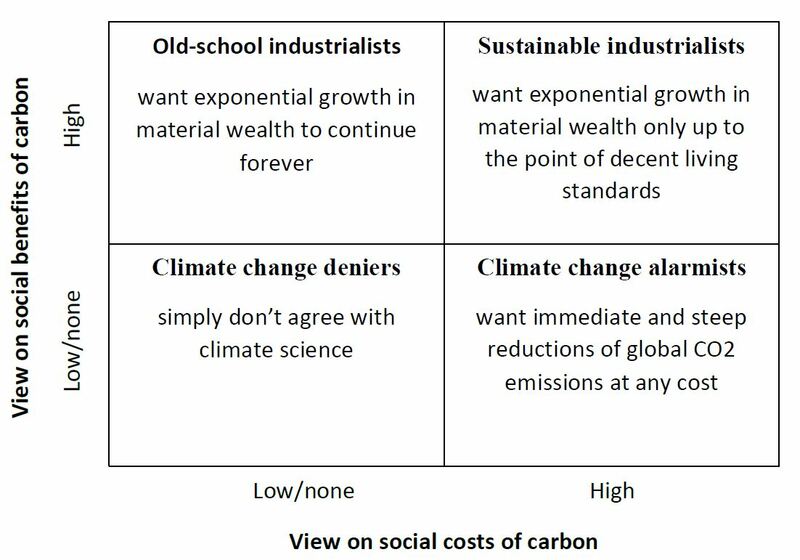 Ignoring the social benefits of carbon during this critical industrialization phase of our global society involves massive opportunity costs and, ironically, will only magnify the social costs of carbon. So let’s get out of the way and facilitate the Chinas of tomorrow in the construction of their hydrocarbon bridges. If done well, the global hydrocarbon bridge can be completed early in the second half of this century (when Sub-Saharan Africa reaches the point where China is today). A continued emphasis on efficiency, unsubsidized deployment of renewables, a gradual increase in nuclear (within political bounds), and mandated emissions cuts in the growing list of rich counties will all contribute to offsetting emissions associated with the building of the hydrocarbon bridge.